Atlanta is a sprawling metropolis, but one of the things that sets it apart from other expansive cities is its distinctive neighborhoods. Virginia-Highland (VaHi, to locals) is named after its major intersection of Virginia Avenue and North Highland Avenue—it’s a destination for foodies and families alike, and is packed with charming bungalow houses. 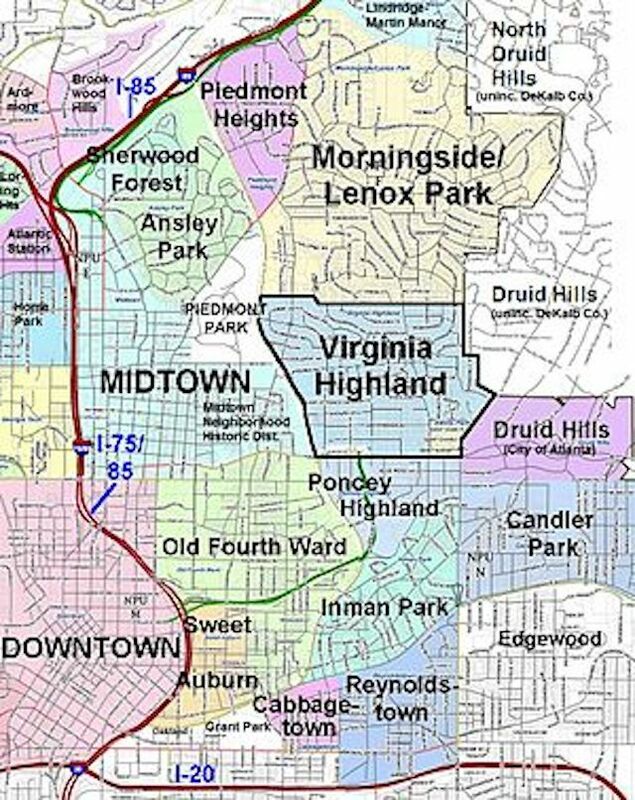 Similar to Inman Park (another cool neighborhood), it was planned to be a streetcar suburb in the early 20th century. The neighborhood declined in the 1960’s when families fled to the suburbs, and the government threatened to build Interstate-485. The highway would’ve connected Freedom Parkway to I-85 at Georgia 400. Fortunately, residents of the neighborhood teamed up to prevent the highway from happening, or it would have surely changed the neighborhood as we know it. Since then it’s bounced back and now flourishes with a strong a nightlife and festival scene. If there’s anything VaHi has plenty of, it’s delicious places to eat. Murphy’s Atlanta has anchored the neighborhood for over 30 years, delighting diners with southern classics. People go wild for their brunch (just a heads up, they don’t take reservations for brunch, so expect to wait). Hint: the wine shop at the front of the restaurant is worth visiting while you wait. Whichever meal you have there, don’t leave without a piece of the Tollhouse pie. Satisfy your international cravings at the recently opened Taco Cowboy. Owned by Atlanta restaurant legend, Tom Catherall, Taco Cowboy has a variety of tasty tacos and small plates along with dangerously strong margaritas. Pasta lovers can head to La Tavola, run by one the city's best restaurant groups, for freshly made noodles and Italian dishes. It’s a small space, though, so make a reservation. Fans of barbecue can get their saucy meat fix at D.B.A. Barbecue, home to two Southern Pride smokers. They offer classic dishes like St. Louis ribs and potato salad, but if you really want to splurge go for the Archie Bunker. A Texas toast base gets loaded up with smoked pulled pork, macaroni and cheese, barbecue sauce and cheese. They have plenty of local beers and cocktails to wash it all down. If you like tiki drinks and dark interiors, the Bookhouse Pub—a favorite of Kate's Club founder and Choose ATL executive director Kate Atwood—is for you. Cozy up in one of the booths adorned with books and order up some pub grub like chicharones, braised beef poutine or a grilled cheese sandwich. The cocktails are classic, along with beer and wine offerings. Other bars with a pub vibe include Neighbor's and Highland Tap. Stretch out your visit to VaHi with some quality time in a coffee shop. Press and Grind doesn’t just have foamy espresso beverages and drip coffee, they also have juices and smoothies. Come hungry, there are biscuits for breakfast and sandwiches for lunch. If you have a gluten allergy or follow the paleo diet, you’re in luck; they have a whole case of treats just for you. Plenty of seating, so bring a group of friends. For tea drinkers, VaHi is home to Tipple + Rose Tea Parlor. No big hats required here. The space is casual and divided between seating and a shop with local provisions. There are over 70 types of loose teas to be enjoyed there, alongside a homemade scone or piece of cake. Like the tea? Buy some to take home with you. Don’t let the relaxed atmosphere fool you, Tipple offers a perfectly posh high tea complete with finger sandwiches and everything. Need a break from all that eating and drinking? VaHi has a gym for every body. Check out Iron Tribe for their high intensity interval training program. Classes are intense, use two trainers and cap off at 20 students. No worries about feeling lost in the shuffle. Barre lovers can get their fix at Fit: To Be, a boutique studio offering barre, TRX, Ballerobica (a blend of ballet dancing and toning) and stretching classes. Or try the signature heated power vinyasa classes at Highland Yoga. The whole city swarms the streets of VaHi every summer for its neighborhood festival, Summerfest. Appropriately named, Summerfest takes place in early summer and brings the community together for music, art and camaraderie. Past performers have included popular local duo City Mouse, Dirty Dozen Brass Band and Roger Clyne and the Pacemakers. Artists travel from all over the south to sell their wares, with something for everyone and all types of budgets. Cool off with frozen lemonade or beer from the concession stands; festival type food (i.e. funnel cakes and hot dogs) is also available for purchase. In winter, peek into the charming bungalows of VaHi during the Tour of Homes. For over 22 years the tour has given people access to eight beautiful houses, each with chefs stationed in them. Tour goers get to find home decorating inspiration while trying bites from neighborhood and nearby restaurants like D.B.A. Barbecue, Highland Bakery and Press & Grind. Inside Atlanta: College Football Hall of Fame CEO John Stephenson, Jr.